The Candler Building was one of Atlanta's most luxurious high-rise buildings of the early 20th century. Great care was taken in the design of the 17-story building as it was meant to be a monument to Asa G. Candler--prominent Atlanta businessman, one-time mayor, and philanthropist who founded the Coca-Cola empire. Candler came to Atlanta in 1873 and his work as a wholesale druggist led to his acquaintance with the original developer of the Coca-Cola formula, Dr. Pemberton, and the druggists who sold the drink. In 1888, Candler, Woolford Walker, and Dr. Joseph Jacobs organized a corporation to take over Coca-Cola. Candler bought out the others' interest over a three-year period. His skills at merchandizing launched the success of his product, and his Coca-Cola-based fortune enabled him to pursue interests in real estate, banking, politics, and the Methodist Church. Asa Candler originally lived in Inman Park but moved to Druid Hills in 1916, the year he became mayor. In 1903, Candler purchased land for his intended office and commercial high-rise. Candler selected architects George E. Murphy and George Stewart, but was involved with many of the construction and design decisions, such as the selection of the snow-white Amicalola marble that sheaths the building's exterior. The marble, from the quarries of the Atlanta Marble Company in northern Georgia, was used in the cornerstone laid December 20, 1905. Within the cornerstone was placed "a Bible, copies of the regular issues of several of Atlanta's daily newspapers and other appropriate souvenirs," including a portrait of Asa Candler and a bottle of Coca-Cola. No expense was spared in design of the Candler Building, to ensure that it would be one of the finest high-rises in the central business district. Typical of the era, its exterior was visually and structural divided into three parts--a two-story base, a 12-story shaft and a three-story capital with large overhanging cornice. The interior of the Candler Building featured special floors designed for use by doctors, dentists, and surgeons; a banking hall; six passenger elevators which were "at all times under the charge of a thoroughly competent engineer"; a barbershop; and what were said to be the "finest baths in America," located in the first basement of the building. Duplicate air-cooling and electric systems were installed to reduce the chance of a total systems failure, and a building-wide "vacuum air-cleaning device" was installed. 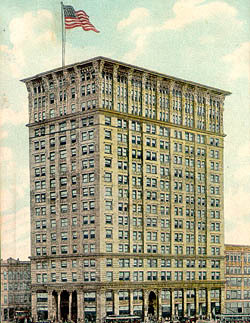 The triangular building had entrances on all three sides; the largest and most elaborate of these was on the Houston Street side and provided access to the Central Bank and Trust Corporation, which Candler organized in 1906 to occupy the lobby floor of his new skyscraper. The size and prominent location of the building, the magnificent sculpture executed by craftsmen under the direction of F.B. Miles, and a total, well-conceived design all contribute to the deliberate monumentality of the building. 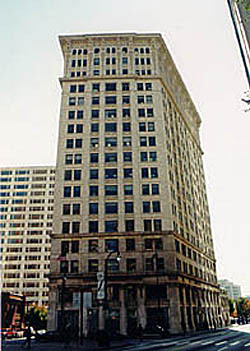 The Candler Building is located at 127 Peachtree St. in downtown Atlanta. It is still used as an office building, and some of the business within are open during normal business hours. The Atlanta Preservation Center also offers guided walking tours. Consult their website for information.